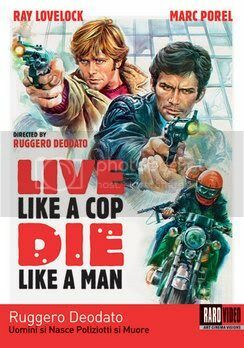 Directed by Ruggero Deodato (Cannibal Holocaust and Last Cannibal World) and written by Fernando Di Leo (Milano Calibro 9, The Italian Connection, The Boss), Live Like a Cop, Die Like a Man takes the already violent Italian crime genre and takes it to a new level. Just released by Raro Video USA, this film is finally available in the states, providing us with another missing piece in the director's varied filmography. Deodato has done everything from the aforementioned Cannibal films, Disaster films (Concorde Affair), Sword and Sorcery films (The Barbarians) and Revenge films (House on the Edge of the Park) so it is only appropriate that he dipped into Italian crime films too. Live Like a Cop, Die Like a Man follows Fred (Marc Porel) and Tony (Ray Lovelock), two cops who believe that the only way to fight crime is with violence. Though their boss (Adolfo Celi) doesn't approve of this method, he still assigns them to the new special force where they try to catch dangerous gangster Roberto "Bibi" Pasquini (Renato Salvatori). Fred and Tony use every method they can, from blowing up a parking lot full of cars to "seducing" Bibi's sister Lina. But will their dangerous tactics pay off or end up getting them killed? Definitely the most violent polizioteschi I have seen, Live Like a Cop, Die Like a Man is also one of the best I have seen. Porel and Lovelock do a great job as the carefree cops who not only ride together on one motorcycle and share an apartment but also share and try to seduce the same women. From a surprisingly vulgar conversation with their boss's secretary to the previously mentioned "seduction" of Bibi's sister, the duo's clean cut, pretty boy image proves to be the complete opposite of their tough, misogynistic demeanor. The action begins with an epic motorcycle chase (right after the title song sung by Ray Lovelock) and doesn't let up for more than a few minutes at a time throughout the film. The only flaw I really found with the film was some of the dialogue, which was a little campy and over the top. On the other hand though, I feel that without this break from the violence and action, the film may have been a little too dark and wouldn't have allowed the audience to breathe. Included on this disc from Raro Video is a new 35mm transfer, a documentary on the film with director and star interviews, as well as some early commercials by Deodato.